Some cool new stuff to announce for you Wild Cards fans out there. We have a couple of brand new original never-before-published Wild Cards coming up on Tor.com, and available for free. 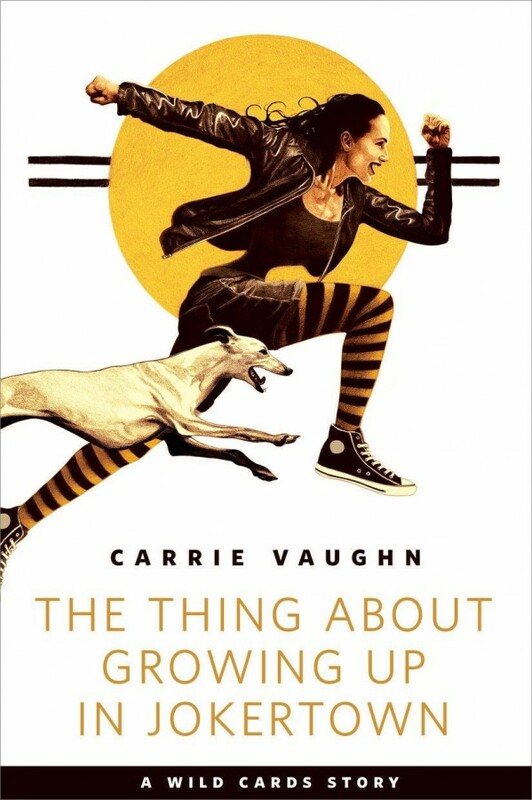 The first of them is "The Thing About Growing Up in Jokertown," by Carrie Vaughn, a prequel of sorts to FORT FREAK, featuring two of your favorite 5th precinct joker cops as teenagers. John Picacio just sent us the cover art, and as usual it's wonderful. Carrie's story will be uploaded to Tor.com on December 21. Hope you'll enjoy the read. (I did). Meanwhile, on other Wild Card-ish fronts... Tor taped hours of interview with myself and a whole legion of my Wild Cards writers in Kansas City, during the big launch event for HIGH STAKES, and will be releasing them in a series of videos. The first came out in late August. The second has just been released. Enjoy. More videos will be forthcoming in future months. What is going on with her waistline?? Hi. Really nice with another Wild Card story. I have a question in that regards. Will this and all the previous one eventually be collected into a single book? Evntually, yes, that's the plan. Will this story eventually be available in a print format (HC or PB)? The man isn't trolling anyone, and it's quite rude to say so simply based on the fact that this isn't a game of thrones post. I suggest looking into wild cards, it's incredibly entertaining and it's very much something worth discussing. Thanks GRRM! I was just kidding. It is just a joke on the Fanpages. It begun 0when everyone was expecting Winds (I think it was last year) and George did some Posts about Wild Cards. Now wherever George posts something about Wild Cards, it became a joke to responde with "he is trolling with us" . I thought I post it to the master himself LOL. It is really just that, a joke. I would never be rude to the man who brought me to read and love fantasy books. What do you think about Wikileaks (Do you like Wikileaks? )and the Podesta Mails. Do you support Trump or Hillary? I also support the right to privacy. Government documents are one thing, but personal emails should remain private. I did not like it during Watergate when burglars broke into Democratic headquarters to steal documents, and I don't like it any better when it is done with a computer and called "hacking." You are off topic, however. Only Wild Cards posts here. Are these more fun to work on than solo work? Do egos ever get in the way when collaborating with other authors? More fun that solo work? Well, not more... but a different kind of fun. I enjoy editing, and I think I am very good at it, but the skill set is not the same as writing. Yes, ego does play a role, especially in a shared world. Smoothing things out and making everyone play nice is part of my job as editor. The pieces don't always fit. Wow, 40 authors all trying to put their spin onto a story, sounds a lot like adult babysitting for you. Well keep up the great editing, love the WC stories. You had me at superheroes for adults. I'll have to check this series out after I finish enjoying the illustrated version of A Game of Thrones. By the by, thanks for signing those copies for the Jean Cocteau Bookshop, it's nice to have an autographed copy from one my favorite authors. I'm very excited to read these! Seems very different, exactly what I'm looking for! WTF happened to the lower part of that girls torso? Im not sure if its an optical illusion, but she appears to have spine covered by skin, and be missing all the usual organs? You don't know the Wild Cards universe, do you? No, I haven't read any of them. Rikki (the teenaged girl pictured) is a joker, her body reshaped and mutated by the wild cards virus. That's why she looks like a human whippet. Don't worry. I'm not going to be asking for an update on Wild Cards every week. But, I am excited to see the Wild Cards universe coming to my television screen. I've been wanting to check Wild Cards out but i can't find them at my local bookstore. Can't wait to read them. I've never read any Wild Card novels. Not sure if it's something that I would be interested, but where should I start if I want to give it a go? Do I have to start at book one, Inside Straights, or can I start with any book? RE: I've never read any Wild Card novels. Book one would work, of course. So would Inside Straight. So would Fort Freak. Ah,these sound pretty good,but never have time to read much anymore.I really want to check these and your werewolf stories out After you finish Winds I might have to take vacation time for that,or maybe not,probably last till the next if I read it on offtime,lol.Seriously though,think I`ll pick up the first book and check them out. since you mentioned a "realistic take" on super powers in the video, have you seen Misfits(the TV show, not the band)? hope you have a great halloween! No, sorry, missed that one. the first few seasons (or series as those Brits call it)are really fun to watch, I think you would enjoy this show too. they have their mind reading or invisibility but also weird ones like lactokinesis.